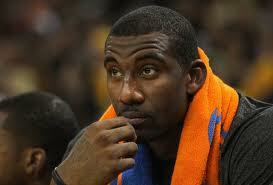 It was made official today that The Knicks Amare Stoudemire is out for game 3 of their series against the Heat. The Knicks star injured himself when he punched a fire extinguisher case on Monday after the teams 104-84 loss in Miami. The Knicks are currently down 2-0 in the opening playoff series. The knicks have had to see this coming. This Knicks team was destined for failure this year. They have not played well as a unit consistently all season. The only bright spot the Knicks had during the season was the rise of Jeremy Lin. The “Linsanity”craze did not even last a month. They almost did not make the playoffs until they had a so-so April. This is just another example of how this team is doomed, at least for this season. The first two games against the Heat should be all anyone needs to see to realize they were never going to beat the Heat and advance. I have no idea why it seems that everyone is shocked by this happening. The media has been all over this story of Stoudemire missing game 3. It really does not matter though. The Knicks had no chance, even if Stoudemire was healthy he would have done nothing to get the Knicks wins over the Heat. There is really only one story here, it is the immaturity and anger issues that Stoudemire possesses. The series was likely going to end in the Heat sweeping the Knicks. The Heat are just too strong for just about any team in the east, especially the Knicks. It will all be over for the Knicks in less than a week from now. So lets put the story of the 2011-2012 Knicks to rest now. This entry was posted in NBA and tagged BASKETBALL, bosh, heat, knicks, lebron James, live sports, Miami, new york, sport, sports, sports schedule, wade. Bookmark the permalink.